The most economical venue for chess coaching is at the Canberra Academy of Chess Centre (Unit 4, 32 Dundas Court, Phillip ACT 2606). Not only is this the cheapest way of being taught, but we have a lot of coaching and learning resources on hand, various chess books and computer programs available for purchase. There are also many inspiring photos of current and previous chess champions on our walls! 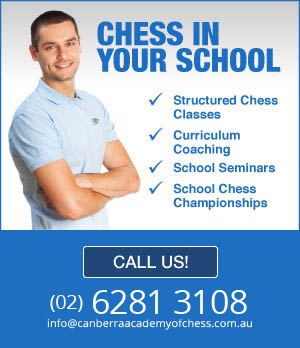 For more information, please call our office - Canberra Academy of Chess on (02) 6281 3108 or (02) 9745 1170.